The Noam Synagogue is located on the ground floor of the Saraya /Wolfson Community Center building. It holds regular services, and offers cultural activities and study sessions throughout the year. There has been a Beit Knesset (synagogue /shul) in the Saraya building since the War of Independence in 1948 when the site first became an Aliya Center. Services continued when the building became the Malben Old Age Home. 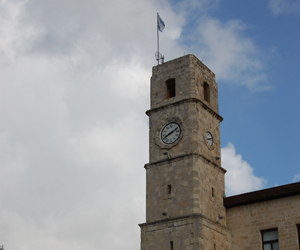 Later, about forty years ago, under the leadership of Rabbi Jehuda, the synagogue, then known as Metzuda, became one for young religious families moving to Safed, as well as one for the senior members of the Malben shul. When the building was renovated, as the Wolfson Community Center, the synagogue remained an important part of its activities. After Noam Jehuda, the son of Shoshana and Rabbi David Jehuda, fell in battle in the first Lebanon war in 1982, the congregation decided to call the synagogue Bet Knesset Noam, to honor his memory. The prayer services in the Noam are in Nusach Sefarad according to the Ari tradition (the main prayer style in Safed) and the congregation covers most of the religious spectrum. This diversity gives the congregation the opportunity to hear different traditions of cantorial singing and Torah reading. Many groups, even from abroad, come to the Noam to celebrate special occasions such as bar mitzvahs, and other visitors are often given an aliya or other honor. The women's section is behind the men's section and is spacious and comfortable. With lace curtains for the mechitza (divider), it is very easy for women to see and hear what is going on. The Noam congregation is very warm, welcoming and child friendly. The courtyard of the Saraya building and its close proximity to a play park makes the Noam an ideal synagogue for parents with young children. On Friday nights between Kabbalat Shabbat and Maariv there is a short sermon on the Parasha (Torah portion) . Before the Torah reading on Shabbat morning there is often a talk on Hilchot Shabbat (Laws of Shabbat). A learning session on The Temple is held on Shabbat afternoon an hour before Mincha and there is a discussion about the parasha and singing during Seuda Shlishit (third meal). There are regular weekly classes available (in Hebrew). Parashat Hashavua (weekly Torah portion) lecture in depth with Rabbi Yosef Bar Kochva is held Tuesday evenings at 8 p.m.
Kabbala study sessions, with Rabbi David Baruch are held Sundays and Wednesdays in the afternoons and evenings. Giyur (conversion) preparatory program with Mrs. Chana Karo is held on Mondays and Thursdays in the evening. A seminar for women on spiritual insights around the Jewish calendar, with Rebitzen Tova Eliyahu, Rebitzen Devora Binyamin, and Rebitzen Tova Bazak, head of Midreshet Tzofnat, (local women's seminary) is held each Wednesday from 09:00 a.m. till 14:00 p.m.
Special events and study sessions are held during the year as well as on Festivals. Discussions are held from time to time with solidarity missions from abroad, students from Yeshivot (religious seminaries), with army cadets and other Israeli groups. On regular weekdays: Only Shacharit (morning) services are held: 06:30 a.m.
Shacharit on Shabbat and Festivals is at 08:00 a.m.
Mincha (afternoon) before Shabbat and Festivals is fifteen minutes after candle lighting time. Mincha on Shabbat is promptly at candle lighting time, followed by Seuda Shlishit (the third meal) and Maariv (evening) at the end of Shabbat and Festivals.